After our six-hour stopover in Oslo, we continued our flight and landed at Evenes ‘Lufthavn’. An airport so small and cute, it made us smile thinking about calling it an airport. 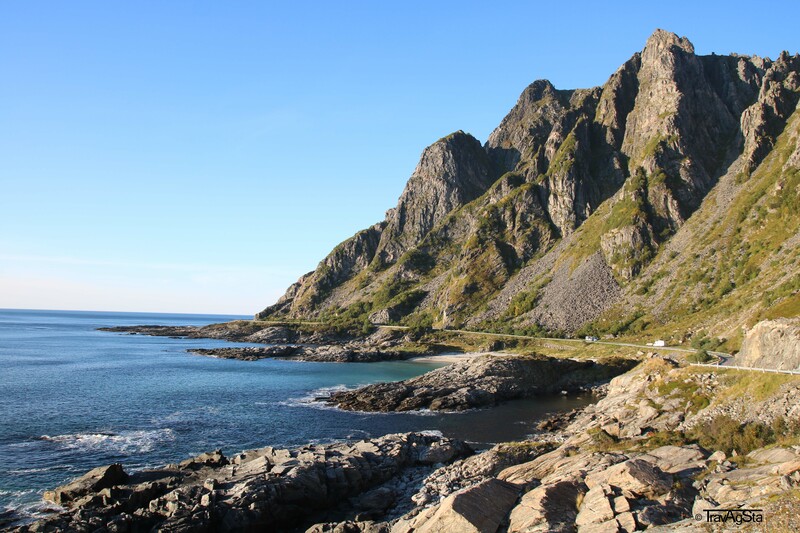 As we arrived really late, we stayed for one night somewhere not far from here and continued our drive the next day heading to the southernmost Lofoten island called Moskenes. Before we start telling and showing you about all the beautiful places, we wanted to give you some hard and soft facts for the school of life. Maybe you’ll need them, maybe not. They really are. And because of this and the fact that Norwegians don’t seem to know any bad, they don’t even lock their doors. There’s nothing going to happen anyway. And because of this, please be nice as well so this will never change! 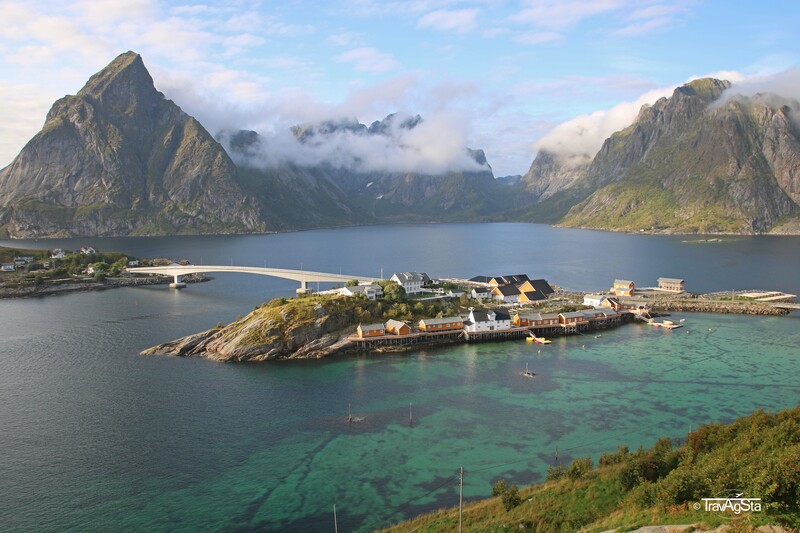 The European Road E 10 goes all the way through the Lofoten archipelago. 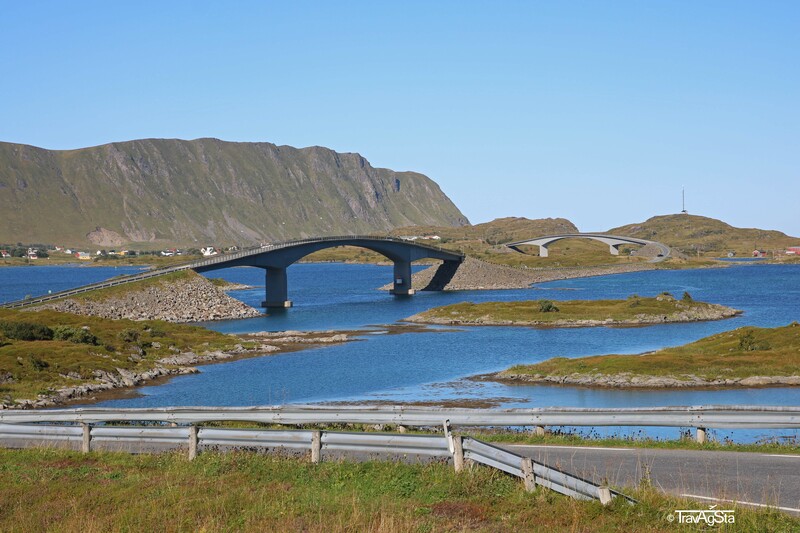 In total, it stretches over 880 km from Å i Lofoten to Luleå in Sweden. 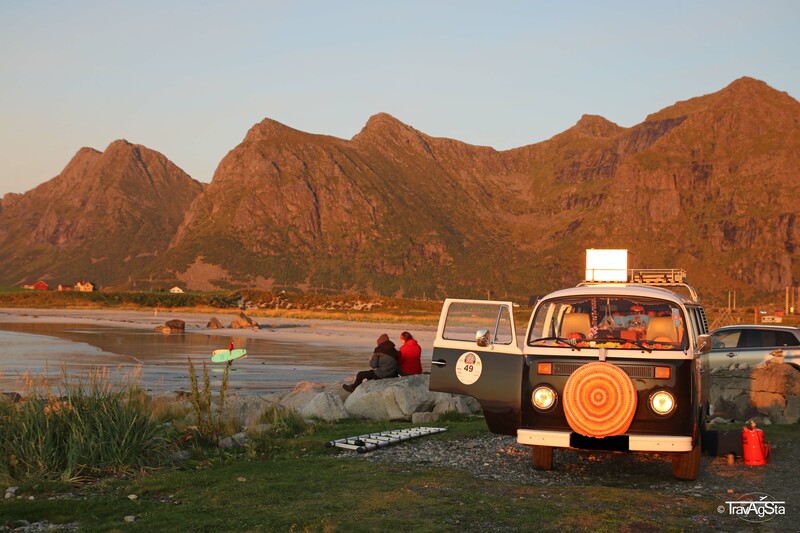 During our road trip, we were using the E 10 again and again; many of the most beautiful views and most amazing beaches are located next to the ‘Lofoten Motorway’. Navigation was quite simple; just take the E 10 in direction north or south through countless tunnels and over even more bridges and you will see the most beautiful places. But don’t forget to explore some of the sideroads, too! 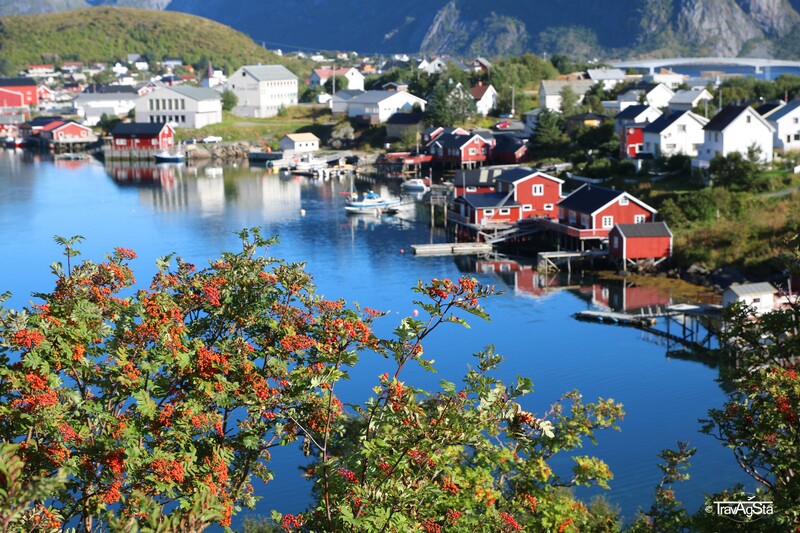 Lofoten is an archipelago of 80 islands located 100km to 300km north of the Arctic Circle. They belong to the county of Nordland. 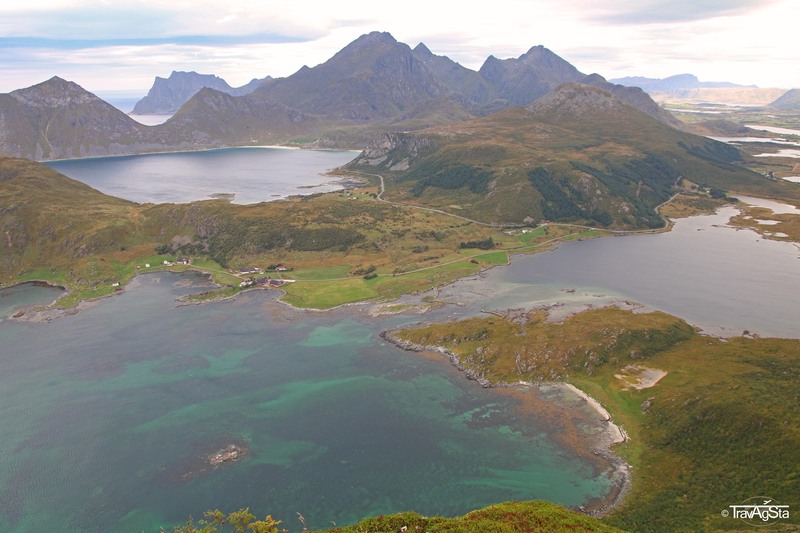 Vesterålen is an archipelago with six islands and is located north of the Lofoten. 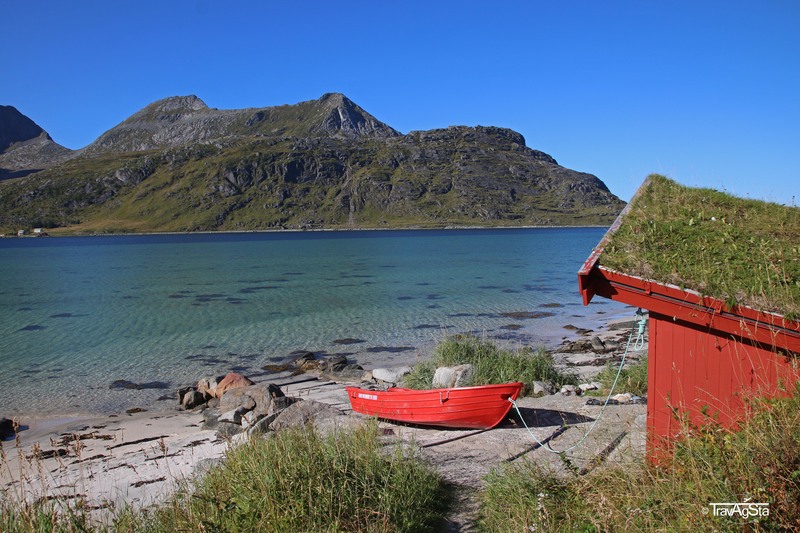 The islands belong to the counties Nordland and Troms. 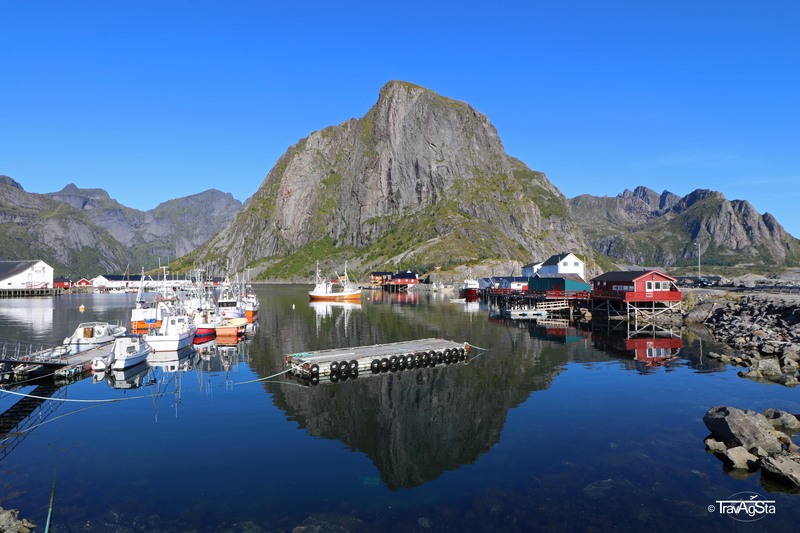 Though located north of the Arctic Circle (Vesterålen reaches 70° northern latitudes), both archipelagos profit from the Gulf Stream and temperatures are quite mild. Both are amazing. 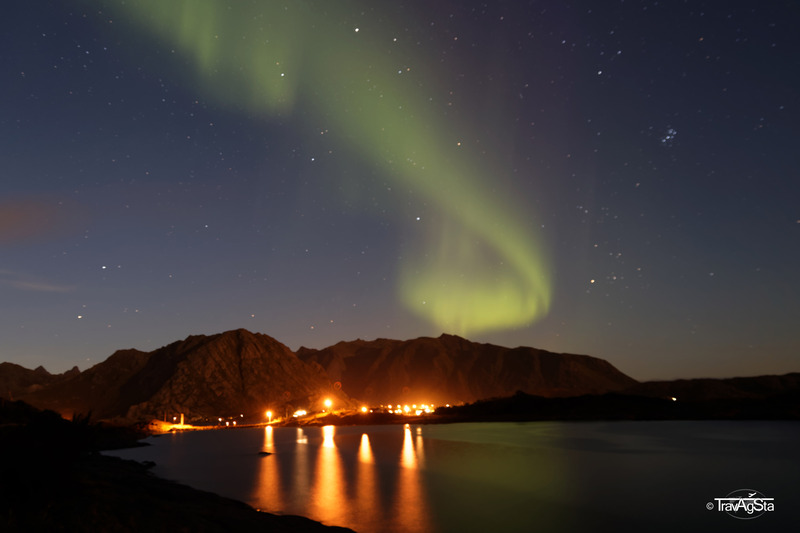 If you want to see the midnight sun, you should come here between the end of May and end of July. Between December and January, there’s polar night and it’s all dark up here. To each their own! As ‘Aurora borealis’ somehow sounds like a mysterious disease, we’re using the terms Northern Lights, polar lights or Lady Aurora. You can see them year round north of the Arctic Circle. Of course, it’s difficult during midnight sun but otherwise, it’s the perfect region. One and half year ago we were in Iceland in March and saw them for the first time. Unfortunately, it was extremely cold so we decided to visit the north again when it would be warmer. And it worked for us! September was the perfect month. The end of September might be even better as in the beginning of September the night starts really late. 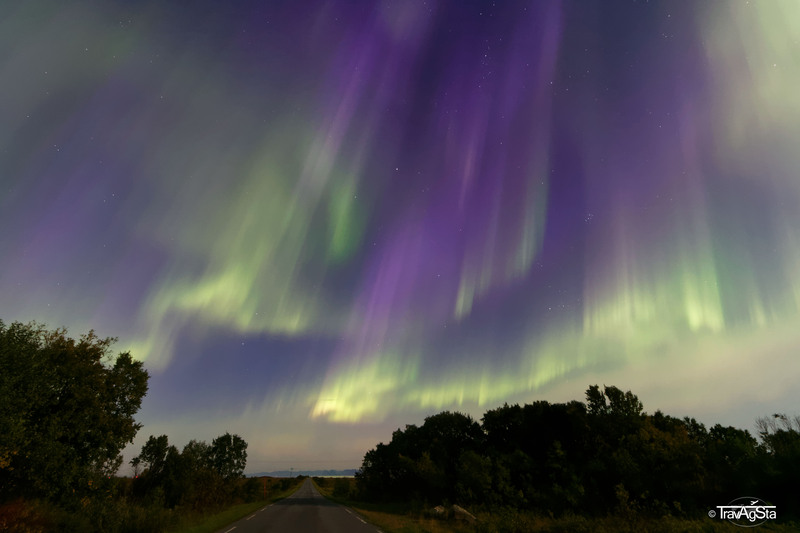 Temperatures were comfortable and to our fortune, we were able to see the strongest Northern Lights in the past 12 years. We were in heaven. 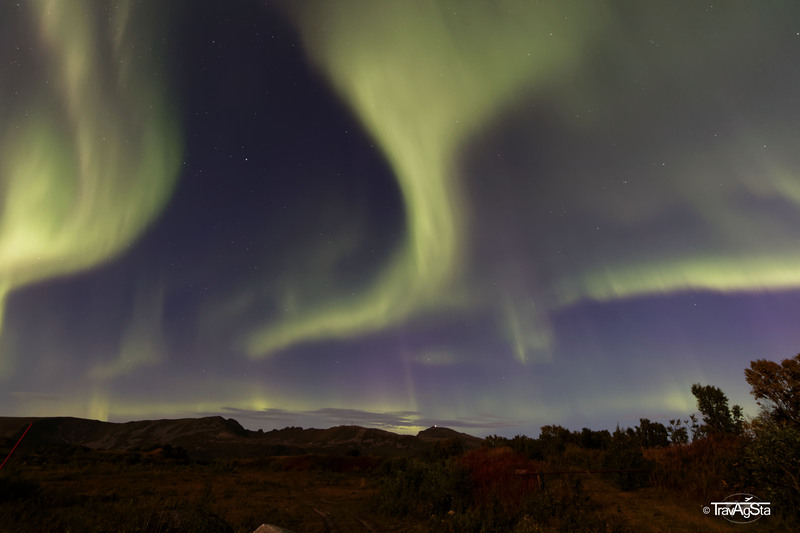 The Northern Lights were the main reason for us to come back to Norway. And of course the landscape and so on. It won’t work out without a rental car. It doesn’t matter if a rental car, a camper or anything else. But you definitely need means of transport. Definitely with heating. There are busses. But if you lived in the countryside before, you know how awful bus connections in rural areas can be and they’re even worse here. 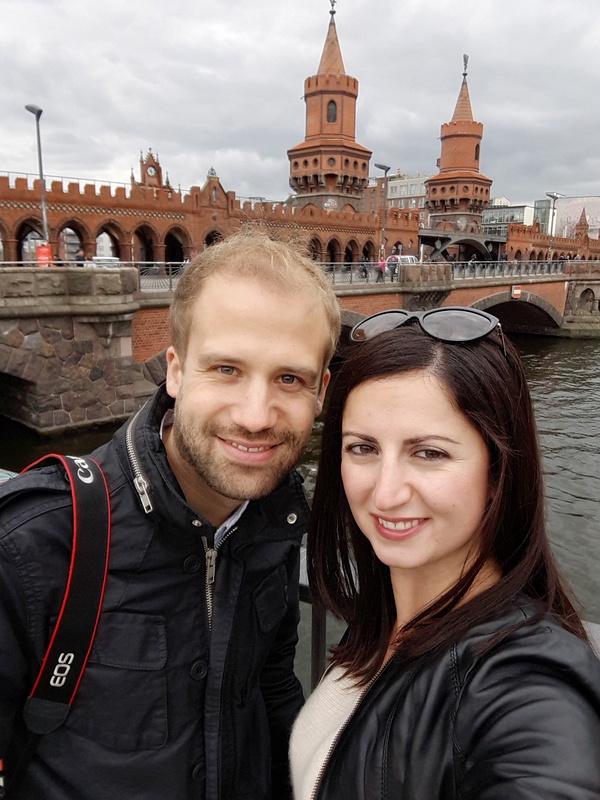 We booked our accommodation via booking.com and AirBnB and they were astonishingly cheap. Except of Reine. But it’s generally expensive there. July and August are the most expensive months and definitely the most crowded. The North men love fish. Everyone knows that. 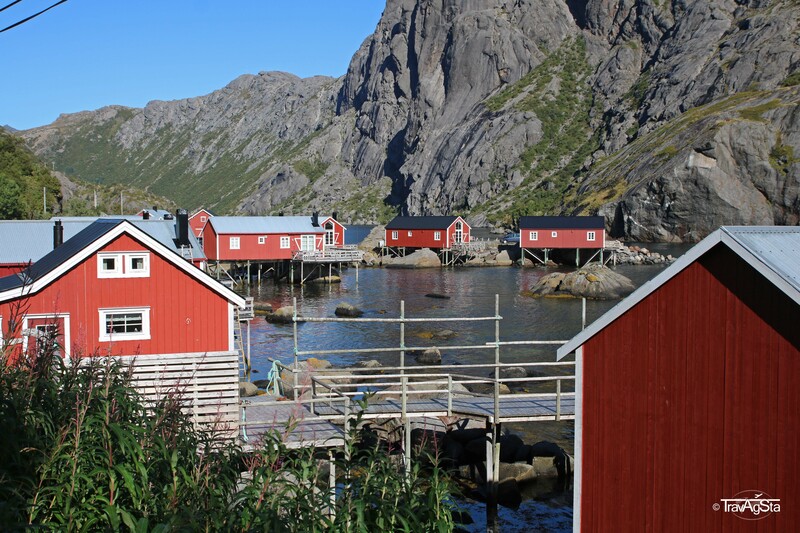 A speciality of the region is dried cod (Torrfisk). Jan thought it tasted ok (diplomatic as always), I think it’s disgusting. It tastes like nothing and smells awful. But hey. To each their own! As said before, we came mainly because of the Northern Lights and the landscapes. 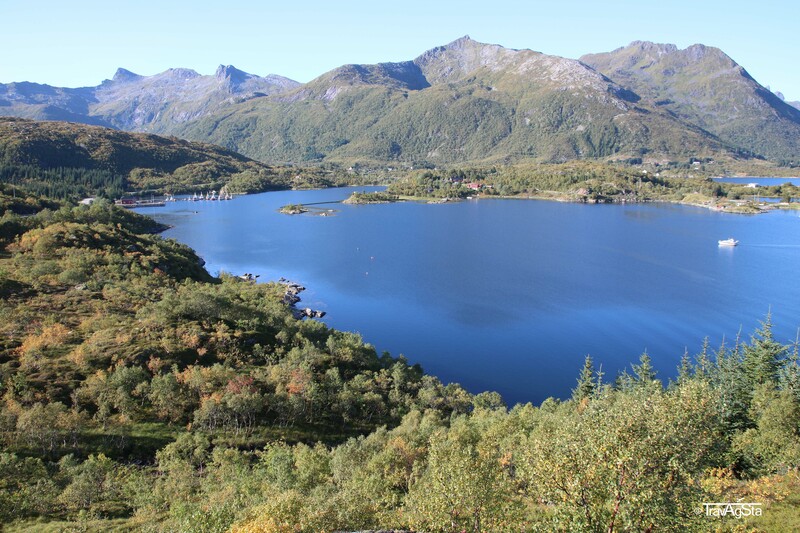 As we have noticed, you can do a lot more here: like hiking, kayaking, boulder, diving and go swimming during the summer months (water temperatures are usually warmer until the end of November than the outer temperatures). And watching birds in July. If the weathers permits. We wanted to do some hikes but couldn’t due to weather conditions. The weather is the general problem here. It just has its own mind. We had three beautiful days during one week. We did as much as possible on these days. The other days were a bit nasty and windy. Just think about a plan B for those days. For example: We had one accommodation with a sauna. Perfect! New York: Where you should eat! Dushi Curaçao – best spontanous decision ever!